Assume for a second that there were no pending questions facing the Elon Musk proposed MBO of Tesla: that the funding was indeed secured, that the Board has signed off on the deal, that the requisite number of shareholders had agreed to roll their equity into the new structure and so on. What would such a deal look like? 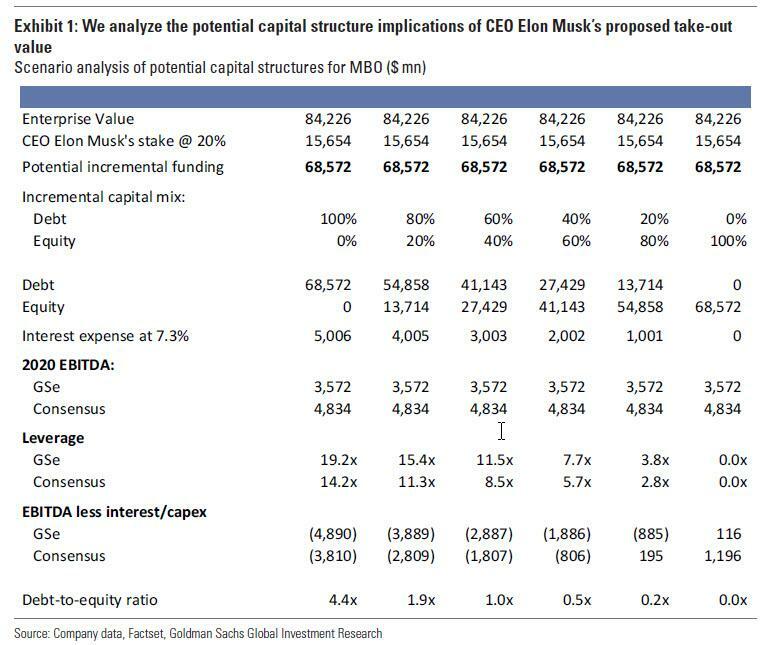 First, the baseline parameters as defined by Musk: At $420 per share, and using an estimated 186.5MM diluted shares outstanding (including exercisable options, and convertible debt that would theoretically be in-the-money), the implied equity value is approximately $78BN. When combined with an adjusted net-debt of approx. $6BN, this implies an Enterprise Value of $84BN —which indicatively is 23.5x Goldman's 2020E EBITDA estimate and 17.5x consensus EBITDA. The next logical question is what could potential financing and interest expense look like post an MBO, in other words, what does the math of the proposed deal look like? It is here that things quickly turn ugly as an analysis by Goldman's David Tamberino finds. According to the Goldman analyst, with $9bn in net-debt, Tesla is currently levered his 2.6x our 2020E EBITDA (and 1.8x on consensus), and the current annual interest expense is tracking toward $650MM — driving an implied average interest rate of approx. 6% (of course a full-blown MBO largely funded by junk debt would have a far higher interest expense). If adjusted for in-the-money convertible notes, leverage would drop to 1.7x GSe 2020 (and 1.2x consensus) —with an implied interest rate of 7.3%. Assuming the company could fund debt at a similar rate, no other shareholders converted to the private structure, and outside equity capital was not lined up — this would imply debt of $68.5bn with interest expense of approx. $5bn. Not only would that lever the company up to 14x Consensus EBITDA, but the interest expense alone would be higher than forecast EBITDA generation, in other words assuming no capex, the company would be cash flow negative, hardly what any LBO investor wants to hear. For the pro forma analysis, we take a traditional LBO approach of 6.0x leverage - in-line with historical LBOs - to get $21BN of debt financing on Goldman's conservative 2020E EBITDA, or $29BN consensus — leaving a need for incremental equity financing in the amounts of $40 to $47bn depending on whether one uses the consensus or Goldman EBITDA. While this would lead to lower interest expense, it would not result in positive cash flow generation when consensus capex of $3.6BN is considered. To allow for the range of outcomes outside of these two structures, Goldman has created the following sensitivity analysis showing potential interest expense at various funding structures. With that hypothetical analysis in mind, the next and key question is does $420/share represent fair value? The answer is: it depend on your views of the company's growth. For this analysis we revert to Goldman's operating assumptions, and specifically the bank's "potential upside" scenarios, in which - even when faced with growing competition from OEMs - the company achieves mass market volumes in the 2 to 3 million vehicle range in 2025; for context, Goldman's base case assumes only ~800k in 2025. In those upside scenarios, Goldman ascribes valuations (discounted back to early 2019) for the overall company that average to approx. $414 per share. 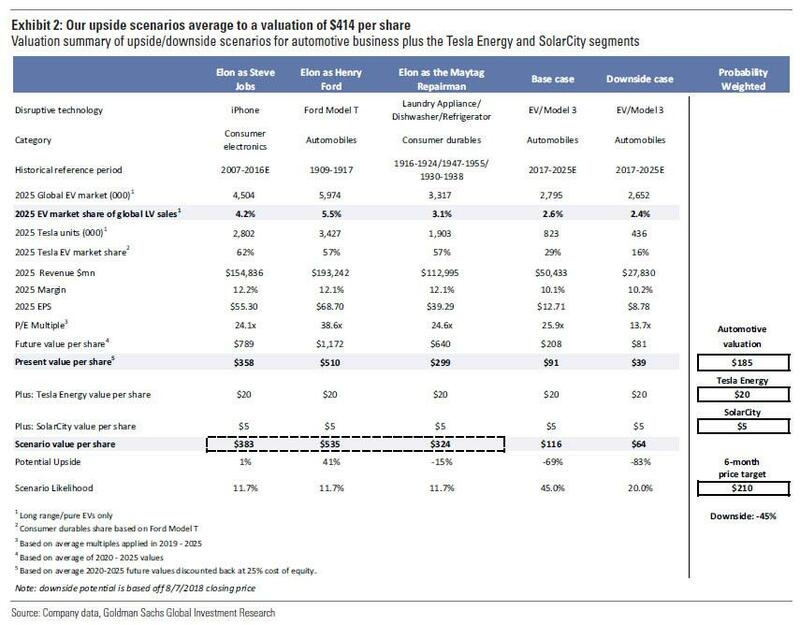 Naturally, Goldman is quick to point out that its base case valuation implies a much lower potential value per share for Tesla - roughly $116 or nearly a quarter of Musk's proposed take out value - given the slower growth rate and forecasted lower margin profile. Finally, some have wondered whether the Dell MBO is an applicable comparable case study? The answer, according to Goldman, is maybe, but the underlying EBITDA/FCF characteristics were far more favorable. A quick flashback of what that deal looked like: In 2013, Dell management led a buyout of the company for $25bn — financed through management’s ownership stake (16%, valued at over $3bn), $750mn in cash on the balance sheet, some incremental equity holders, and debt of approx. $19.4bn (debt-to-equity ratio of 3.5x). While the transaction was somewhat similar in nature to what is being proposed at TSLA, the EBITDA generation and cash flow characteristics of the business were very different given a more mature product and growth profile: Dell’s reported 2013 adjusted EBITDA was $5.1bn (implying 3.4x leverage at-close) and FCF generation was approx. $3BN. By Comparison, excluding working capital gimmicks, Tesla is run rating around $1 billion in cash flow burn per quarter. In other words, even if one assumes that all the MBO preconditions are in place, and Musk does indeed have the financing locked up, the far bigger question is just who would have agreed to lock themselves up to a capital structure that is more suitable for a mature, cash flow generating business, whereas Tesla still remains largely in the realm of pure equity - after all just the interest expense alone would leave zero residual cash for equity investors.